Harrison Schmitt, Apollo 17 Lunar Module pilot, is photographed next to the American Flag during extravehicular activity (EVA) of NASA's final lunar landing mission. 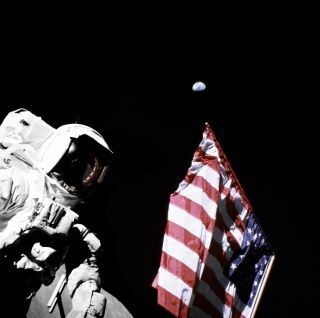 In this historical photo from the U.S. space agency, geologist-astronaut Harrison Schmitt, Apollo 17 Lunar Module pilot, is photographed on Dec. 13, 1972 next to the American Flag during extravehicular activity (EVA). It was NASA's final lunar landing mission in the Apollo series. The photo was taken at the Taurus-Littrow landing site by astronaut Eugene Cernan. The highest part of the flag appears to point toward Earth in the distant background. Schmitt was the first scientist-astronaut to land on the moon. With help of a lunar rover, Harrison and the other astronauts collected 243 pounds (110.4 kg) of moon rocks and dust. Apollo 17 was the last mission to the moon. Each weekday, SPACE.com looks back at the history of spaceflight through photos.